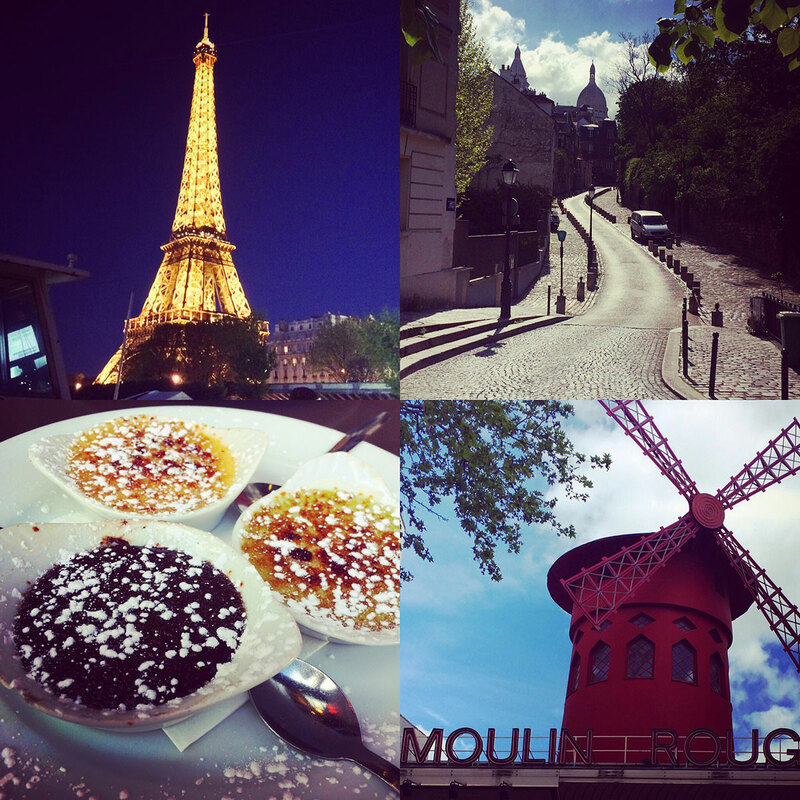 A mother-daughter trip to Paris was the experience of a lifetime. We spent ten days taking in as much art, history, and delicious food as possible, walking about eight miles a day fueled by croissants and strong espresso coffee. Mom & I spent several months immersed in planning for our first trip to Europe: researching traveling and tour options, applying for passports, practicing the art of packing light, discussing outfits and testing many pairs of shoes, studying maps to navigate the city. Anticipation for all things Parisian was a great excuse to revisit some favorite French films – Midnight in Paris, Amelie, Moulin Rouge, Paris, je t’aime. I also brushed up on my high-school French, apparently just enough to become socially awkward in two languages. Example: greeting Cedric at the hotel’s front desk with a cheerful “Merci!” as we arrived – oops! Best of Paris Itinerary: We’ll gather at our hotel in Paris at 3 p.m. for a short meeting and orientation stroll around our neighborhood, followed by a panoramic tour of the City of Light aboard a private bus. Then we’ll get acquainted with one another over a delicious “Welcome to Paris” dinner together. Sleep in Paris (6 nights). Bus: 2 hrs. Walking: light. This was our first morning waking up in Paris. After a delicious breakfast of café au lait and croissants in the breakfast room downstairs, we took some time to shake off the jet lag and explore our new neighborhood. We walked through the park around the Eiffel Tower, saw the gold dome of Hôtel des Invalides, crossed the Seine on a gorgeous bridge (with a bridal photo shoot in progress), and found our way to Avenue des Champs-Élysées, which leads all the way to the Arc de Triomphe. 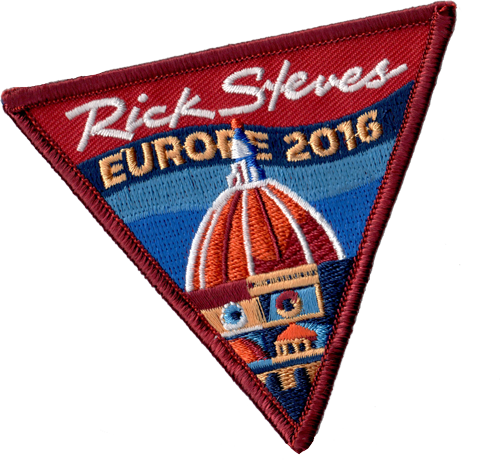 At 3:00 p.m., we met our tour guide, Arnaud, and the other 22 members of our Rick Steves tour group. Over wine and cheese, Arnaud led us in a round of introductions, offered observations and tips on making the most of our time in Paris, answered questions, distributed museum and metro passes, and taught us how to use our whisper audio system that would keep us connected to his instructions for the next 6 days. He delivered lots of information with the efficiency of a seasoned guide, along with a delightful sense of humor and charming Parisian accent. Our group ventured out, walking through the Rue Cler street market, and getting to know the neighborhood. We took a brief bus tour around Paris, then had an outstanding dinner at La Terrasse: white wine-blackberry current aperitif, salad nicoise, salmon with green beans, table wine, very decadent chocolate lava cake dessert and cafe. I’m going to like Paris! 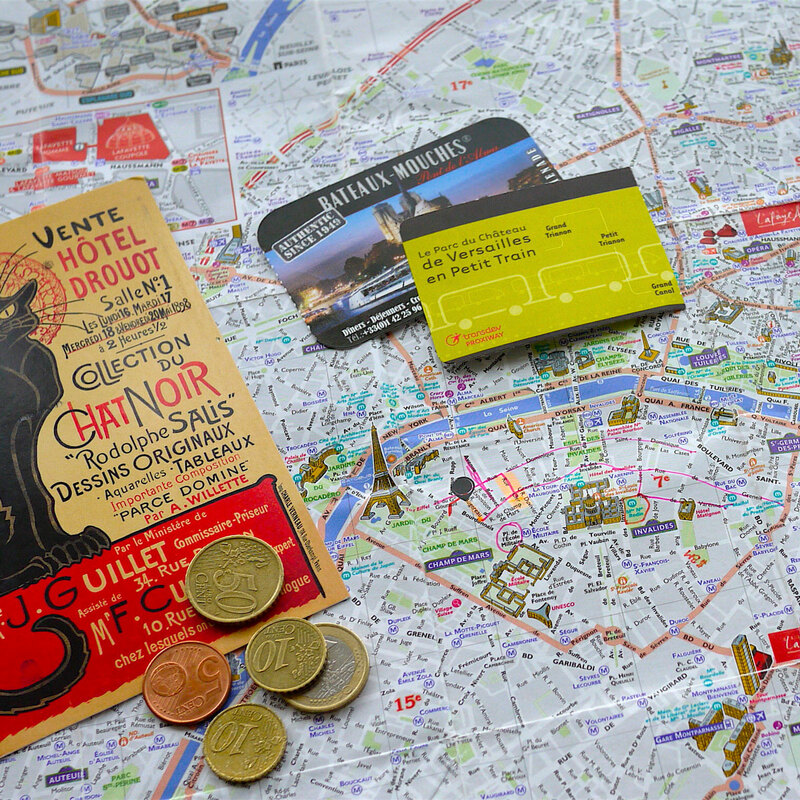 Best of Paris Itinerary: Let’s begin where Paris did, on the Île de la Cité. Your guide will lead a walking tour of the city’s early history, including visits to a pair of the world’s most significant medieval Gothic churches: the legendary Notre-Dame Cathedral and the exquisite Sainte-Chapelle. Then we’ll take a stroll through the bohemian Latin Quarter, with free time for lunch on your own. We’ll end our afternoon at the Cluny National Museum of the Middle Ages, where after an introduction, you’ll be free to visit the sublime Lady and the Unicorn tapestry and have a rare, up-close look at the artistry of original stained-glass windows from Sainte-Chapelle. Walking: moderate. We met with the tour group after breakfast, and jumped right into an orientation on the Metro system – at Monday morning rush hour! We bravely took the underground subway to the Île de la Cité, historical center of Paris. First we stopped at the fabulous Sainte-Chapelle, famous for its beautiful stained glass windows, and continued to Notre-Dame, Paris’ cathedral, known for its hunchback Quasimodo. We spent a lot of time looking at the facade and portals to the cathedral, learning about the significance of the statues and the the stories they tell. At lunch time, we joined Julie and Suzi for an outdoor salad lunch in the Latin Quarter. After lunch, Arnaud led a tour through the quaint Latin Quarter, passed by Odeon theater, Luxembourg Gardens, the Pantheon, the Sobonne University, and Musée de Cluny, which is entirely dedicated to medieval art, and has a display of the famous The Lady and the Unicorn tapestries. We explored the museum, then headed back to the hotel with some others from our group. In the evening, we had a light supper with Katie at Bistro St Dominique: baked camembert cheese with honey, served with a baguette; ham & cheese omelette. As we walked home, Mom was struck by a sudden urge for crepes, so we popped into an odd little restaurant down the street. (The place always seemed closed, with a locked door, although you could sometimes see a woman standing in the back.) The creperie was empty but its door was open this time, so we gave it a try – the sweet crepes were fine, mine was even served on fire! 🔥 A good ending to an action-packed day. Six-foot bronze version of the Statue of Liberty in Luxembourg Gardens, made by Frédéric Bartholdi in preparation for creating the full-scale version. Best of Paris Itinerary: This morning we’ll hop on the Métro, then hike up Montmartre to tour the colorful neighborhood which was the haunt of artistic geniuses a century ago—including Van Gogh, Picasso, and Renoir—and generations of hopeful artists since. 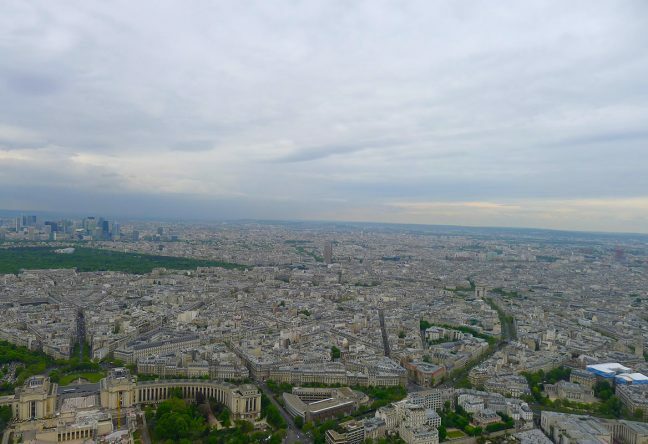 We’ll end our walk with spectacular views of Paris from the Sacré-Coeur Basilica. You’ll be free for lunch and have time to explore more of the city on your own this afternoon. 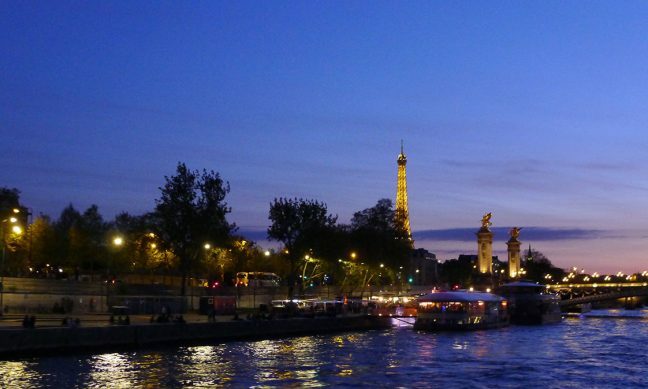 We’ll regroup this evening to enjoy a wine tasting and dinner together before embarking on a dreamy Seine River cruise. Boat: 1 hr. Walking: strenuous. Tuesday, May 3: Bon Anniversaire! What a happy coincidence that on my birthday our tour was scheduled to go to Montmartre, site of the Moulin Rouge and one of my favorite films, Amelie. It was surreal to walk through the cobblestone streets and hear an accordion playing a tune I know so well from the soundtrack … I kept expecting Amelie to appear and lead me on a little tour. We met our tour guide at the top of a tram ride to picturesque Montmartre – he kept us entertained with many bad puns and colorful stories about the history of this artists’ village. During the Belle Époque, many artists had studios or worked in this area, including Salvador Dalí, Amedeo Modigliani, Claude Monet, Henri de Toulouse-Lautrec, Pablo Picasso, Camille Pissarro and Vincent van Gogh. It was an absolute thrill to be in this place with so much artistic history and inspiration. We also saw locations from the films Amelie and Paris, je t’aime. After the tour, Mom and I had lunch at Amelie’s restaurant, Café des Deux Moulins (of course!) – and I was sitting about in the place where she is cleaning the glass behind the object of her affection. ❤️ After lunch, we did a little window shopping, and stopped for crème brûlée and espresso. Then we visited the Musée de Montmartre and Renoir Gardens. What a charming museum! Founded in 1960, the museum was built in the seventeenth century as the Bel Air House and is the oldest building in Montmartre. During its heyday, 12 rue Cortot served as a residence and meeting place for many artists including Auguste Renoir, Suzanne Valadon and Émile Bernard, who held their studios here. We got to peek into Valadon’s apartment, and got goosebumps. In the garden, you can see the actual swing depicted in Renoir’s The Swing. More goosebumps. Back at our hotel, a wine and cheese tasting event had just started. Mom went to the room to rest, and I let some delicious French wines take the edge off. 🍷 We regrouped for dinner with our tour group at Bistro Saint Cirgues. This sweet family restaurant served up risotto with mushrooms for dinner, followed by a waffle with strawberries for dessert … mine came with a candle and a rousing chorus of Happy Birthday from our new friends. Paris is a great place to celebrate! Best of Paris Itinerary: We’ll begin our day with a walking tour through Paris’ diverse, history-layered Marais district. As we walk we’ll learn about enlightened 17th-century urban planning at the beautiful Place des Vosges, the cultural roots of the Jewish Quarter and how the French Revolution grew from this neighborhood. Our walk will end at the Carnavalet Museum, a cavalcade of Parisian history, which you can visit on your own. 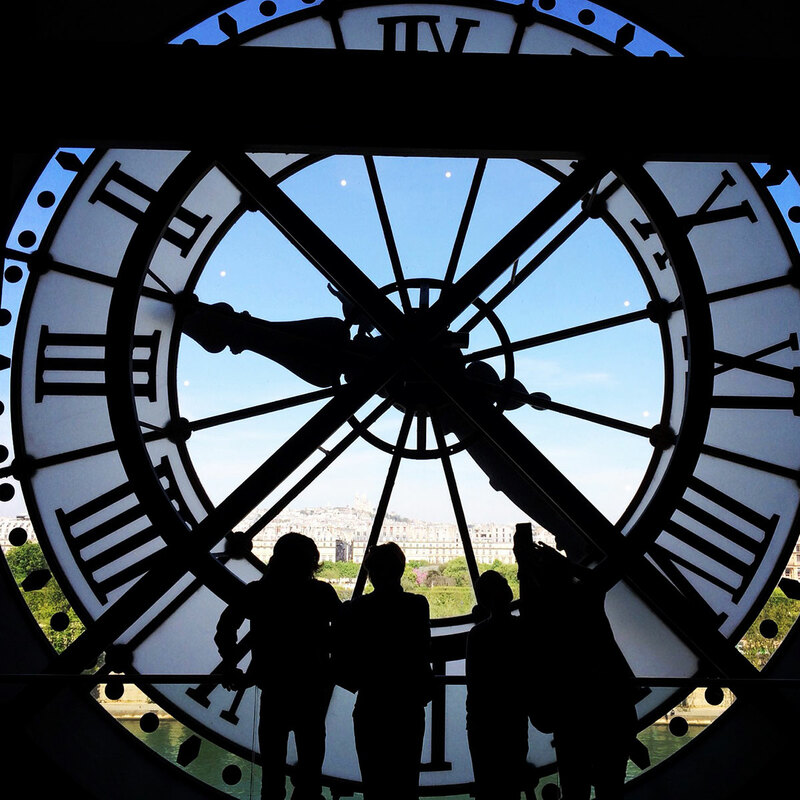 This evening, Europe’s greatest museum—the Louvre—is open late, and we’ll take full advantage of that. You’ll come face-to-face with the works of Rafael, Delacroix, and Leonardo, and timeless treasures that include Mona Lisa, Winged Victory, Venus de Milo, and hundreds more. Walking: strenuous. We enjoyed strolling through the Marais district. There was a beautiful little garden with dozens of little birds swooping through and singing. It’s so lovely to find these little pockets of green where you can step out of the busy city for a moment. We had lunch with Darrin and Tami at a Middle Eastern restaurant – we knew it would be good, because there was a long line out the door. It was our first time eating falafel, and we had a really fun time visiting with this delightful couple. After lunch, Mom and I shopped around the Marais district and sampled some macarons at a cute little bakery. We met our tour guide, Charles, who led us through the highlights of the Louvre – Venus de Milo, the Wing of Victory, the Crown Jewels, and of course Mona Lisa. I hardly took any photos today – there was just so much to take in with my eyes, so much amazing European art. One thing that stood out: a 3,750-square-foot ceiling painting by American Cy Twombly – suddenly you find yourself in the sea and sun of the Mediterranean. The Louvre has room for everything. Tip: Wednesday night is a perfect time to visit the Louvre, when it is open late. Except for the Mona Lisa exhibit, it was not crowded at all! Best of Paris Itinerary: Today we’ll explore the elaborate palace that Louis XIV, XV, and XVI called home. We’ll make the 30-minute train trip to Versailles, where we’ll have a guided tour of the dazzling Hall of Mirrors and other sumptuous rooms of the palace. You’ll then have free time to wander through the expansive gardens and visit the farm animals at Marie Antoinette’s hamlet—or zip back to Paris early via one of the frequent trains. Train: 1 hr. Walking: strenuous. 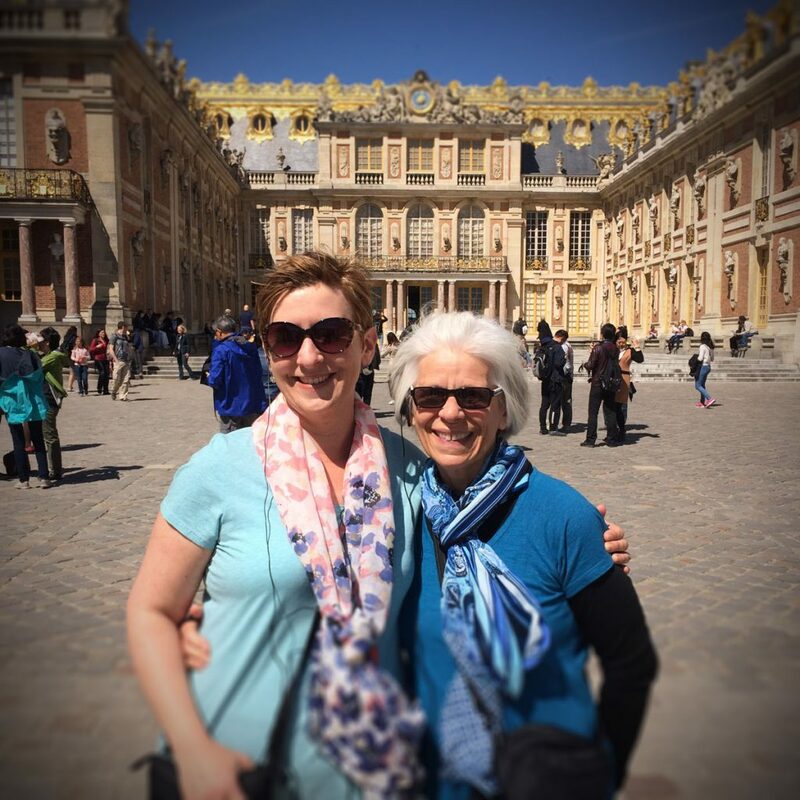 Our Versailles day trip coincided with the beginning of a 4-day holiday weekend to celebrate Ascension Day, and gorgeous spring weather – so it was a very popular destination. We took the RER train from Paris in the morning, and Arnaud led our group through a less-crowded back entrance into the palace. There we met Catherine, our tour guide for the day and a long-time friend of Arnaud. She led an interesting tour of the immense 18th-century palace, with guilded apartments and Hall of Mirrors. I recalled that some friends were visiting here in January, and the palace was closed due to a strike; they were able to view the Hall of Mirrors without any other people – that must have been incredible! Our tour ended outside with an amazing view of the gardens, greenhouses, and the Grand Canal down below. After a forgettable touristy lunch, we strolled the gardens to view the marble statues, then took the Petit Train to view more of the property, which included the Grand Trianon and Marie-Antoinette’s estate. There were long lines of people waiting to get back to the palace via the petit train, so we kept our seats and just went along for the ride. The impressive fountains were turned on in the late afternoon, and there was classical music playing in the gardens – a nice touch. Tips: Arrive at Versailles early in the day, and go see Marie-Antoinette’s digs. Arrange to rent a bike and pedal around the property, and enjoy a picnic lunch in one of the lovely open green spaces. We took the RER train back to Paris in the late afternoon, then popped into the laundromat across the street. After a few tries, and patient instructions from Arnaud at the front desk of the hotel, I managed to do a load of laundry while Mom took a nap. Our efforts were rewarded with a batch of clean clothes and another fabulous dinner at Café Constant on the corner. Le Mélancolique in the garden of Versailles. Marble, 1675-1680 by Michel de La Perdrix. Seems like a nice place to be … not sure why he’s feeling blue. Château de Versailles gardens – a remarkable perspective with no people in the photo! Best of Paris Itinerary: This morning we’ll tour the Orangerie Museum featuring Monet’s magnificent water lilies and home to a fine collection of other works by Renoir, Matisse, Picasso, and more. You’ll be well oriented and have time this afternoon to see the world’s greatest collection of Impressionist art—almost next door—at the Orsay Museum, with art from Monet and Degas to Cézanne and Gauguin, and beyond. 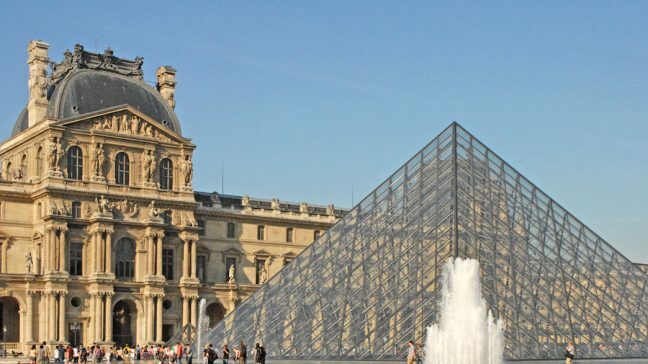 Or visit other nearby places covered by your included 6-Day Paris Museum Pass, such as the Rodin Museum, or the military museum of Les Invalides. Tonight we’ll enjoy a farewell feast together, sharing travel memories and toasting new friends. Salut! Walking: moderate. We visited two wonderful museums today: Musée de l’Orangerie with a fabulous guide, Joelle, who was Arnaud’s art history teacher. She gave us plenty of time to learn about and appreciate Monet’s great project, The Nymphéas [Water Lilies], which occupied the artist for three decades. One enters these rooms by way of a small, empty circular room, painted in white with a single skylight. The intention is to clear your mind, to become new, “like a child”, and allow for the full-color impact of what is to come. The museum displays the panoramic frieze of the Water Lilies in two elliptical rooms, and the effect is magnificent. Fun fact: an orangerie is a greenhouse for citrus trees. This museum building was built in 1852 as a winter shelter for the orange trees that lined the garden of the Tuileries Palace. Before then, the orange trees were housed in the Grande Galerie of the Louvre. Next we visited Musée d’Orsay, a museum with an impressive 19th and 20th century European art collection housed in Gare d’Orsay, a Beaux-Arts railway station. The beautiful clocks in the museum were made famous in the film Hugo, and it is amazing to see Paris through the glass face of a clock. We had lunch in the hip café on the top floor, and enjoyed wandering through the museum’s many galleries afterwards. Our final tour group dinner was held at Le Bosquet. The wine was flowing and the conversation lively! I tried one snail (escargot) – now I’ve done it! Delicious artichoke starter, duck for dinner, apple tart for dessert. It was a little sad to say goodbye to our new friends from the tour – like the end of summer camp. We had a lot of fun experiencing Paris with this group, and Arnaud was a terrific guide! Best of Paris Itinerary: Tour Over After Breakfast. Breakfast is provided, but there are no group activities today. It’s a breeze to reach Paris’ airports by taxi, shuttle or public transportation. Your guide will help you with any post-tour planning, leaving you well prepared for the road ahead. Merci et au revoir! We said goodbye to Arnaud and friends from our tour over breakfast, then headed out to make use of the last day of our museum pass. First we did a little shopping at the upscale Le Bon Marché Rive Gauche, the oldest (and perhaps most expensive) department store. Ooo-la-la! We window-shopped a little, bought a few treats at a dry goods store with tablecloths and aprons, and explored a few of the sweet little pocket gardens. We discovered Café Varenne nearby and had a delicious and relaxing lunch – fresh green bean salad, ratatouille, and good people-watching. 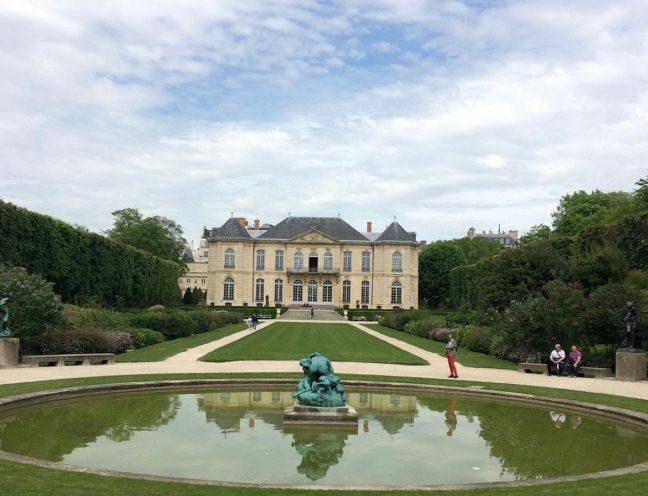 In the afternoon, we visited the outstanding Rodin museum and sculpture gardens. Rodin rented space, lived and worked here in the early 20th century – one of the exhibits is a recreation of his workshop area (goosebumps!) Among the other artistic tenants of the Hôtel Biron were the writer Jean Cocteau, the painter Henri Matisse, the dancer Isadora Duncan and the sculptress Clara Westhoff, future wife of the poet Rainer Maria Rilke. In 1908, Rodin rented four south-facing, ground-floor rooms opening onto the terrace, to use as his studios. From 1911 onwards, he occupied the entire building. Musée Rodin was also Rodin’s workshop, and contains most of his significant creations, including The Thinker, The Kiss and The Gates of Hell. Many of his sculptures are displayed in the museum’s extensive garden. Fun fact: the park covers nearly three hectares (7.4 acres) – and we walked over 14,000 steps today. This evening, we strolled through the Rue Cler street market, had dinner in an Italian cafe, and dessert from a street vendor for dessert. It was a nice “vacation” moment to walk down the cobblestone street in the evening, eating ice cream. Today was Mother’s Day back home, so this was Mom’s special day and very well spent in the vast Jardin des Plantes (garden of plants) – the main botanical garden in France. We had purchased tickets in advance to see Claude Monet’s gardens in Giverny, but opted to go here instead: no need for a train trip out of Paris, and no holiday crowds. 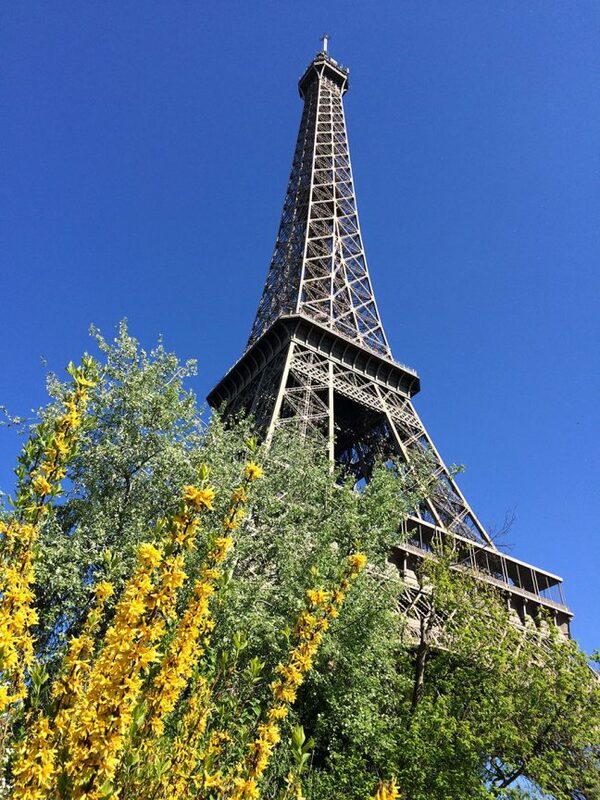 Mother’s Day is celebrated in late May in France; however, May 8 was both the final day of a 4-day Ascension holiday weekend and Victory in Europe Day – so we expected tourist attractions to be busy. I was torn, until a friend advised that Monet’s Gardens is equal to Versailles in level of popularity. Jardin des Plantes it is! Plant species are grown in a number in botanical and alpine gardens, and restored 19th-century hothouses. In addition to serving as the site for the city’s huge Museum of Natural History, the park is also home to a small zoo. It was a perfect spring day for garden strolling and picnic lunch, and there were plenty of colorful tulips and lilacs in bloom. For dinner, we aimed to try a place where President Obama had dined: La Fountaine de Mars on Rue Saint-Dominique. When we arrived, there was the bustle of a film crew setting up outside, and a fancy Italian car parked out front. When I requested a table, the host said they weren’t open yet. I had read that this is a place Parisians go to see and be seen … perhaps we weren’t the target clientele? 😉 Lucky for us, Rue Saint-Dominique is home to no less than three restaurants by chef Christian Constant. We had a wonderful meal at Les Cocottes, concluded with a truly fabulous dessert, just as the name promises.